Thanks for visiting the River Valley Lodge and Campground site and we hope that we will see you soon. Normally a complex like the River Valley Lodge and Campground would begin with detailed drawings and blueprints but this one began with a dream and a concept! It would basically have been impossible to put the gentle flowing of the Des Moines River, the soaring of the eagles, the laid back atmosphere of Southeast Iowa, the glistening mirror finish of the quiet ponds, the beautiful sunsets, and the rustling of the giant cottonwoods on paper. Of course the detailed drawings and blueprints came later as required but Mother Nature had already provided the setting and Steve and Carolyn Kokjohn had provided the dream and concept. 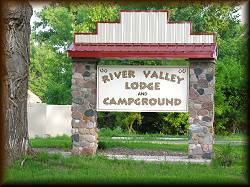 As you have no doubt guessed, the dream and concept are now a reality and the River Valley Lodge and Campground is ready for your enjoyment. The transition from dream and concept to reality did not come quick or easily. It was the result of the combined efforts of many talented individuals and hours of their labor that made it what it is today. To all of those individuals, Steve and Carolyn say "thank you......a job well done". The result of all this dreaming, planning, and hard work is a state of the art family oriented lodge and campground with a definite western atmosphere that will match, if not surpass, anything similar in the tri-state area. No matter if you are just a couple wanting a place to bring your horses, camp, and ride the many forested trails, a large group wanting to rent the beautiful lodge for some type of a get-together, or a horse group/organization that would like to rent the arena or even the complete campground, you will find that River Valley Lodge and Campground in Southeast Iowa is the place to go. Of course horses are not required and all campers are definitely welcome. Just remember that this complete complex is very flexible and adaptable thus we will make every attempt possible to meet your needs. 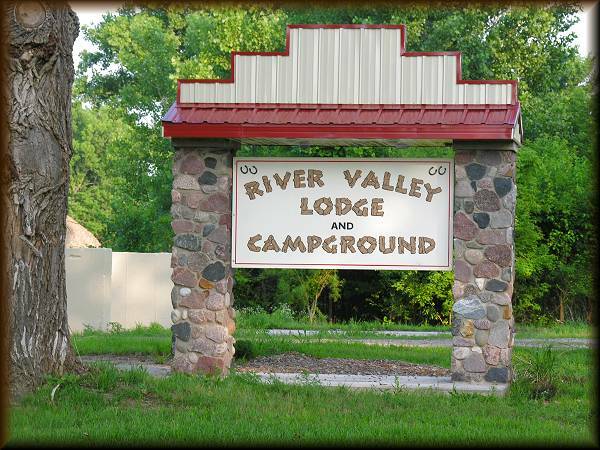 Please use the menu on the left to navigate this site and find the specifics about all of the amenities that River Valley Lodge and Campground has to offer.